All users have the option to set up their personal board settings, e.g. 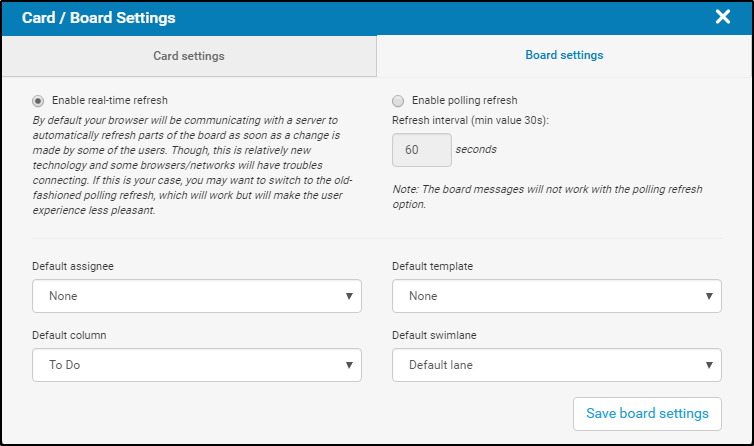 to define a column and/or swimlane where cards are to be created by default or to set up a default assignee and a default card template for a board. These settings are configured per user and per board. 1. 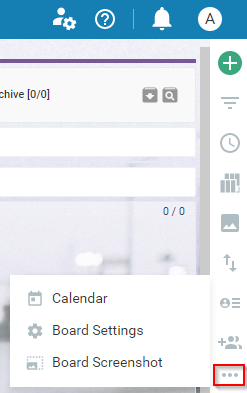 To open your Personal Board Settings panel -> click on the ellipsis menu at the sidebar right of your board interface. In this tab, you can select to have either a real-time refresh or a polling refresh (you can define the refresh interval- minimum value is 30s). NOTE: The real-time refresh is the recommended option. Please enable the polling refresh option, only if you have been advised to do so by our Support team. Please, select the default value from the dropdown list for each of the properties -> click on Save Board Settings to save the changes. - If you set a default property (for example: a default column), every time when a new card is created via the plus button on the top of the sidebar -> it will be created in the pre-selected column. - if you select a default template, every time when you create a card, it will automatically get the properties from the designed template.